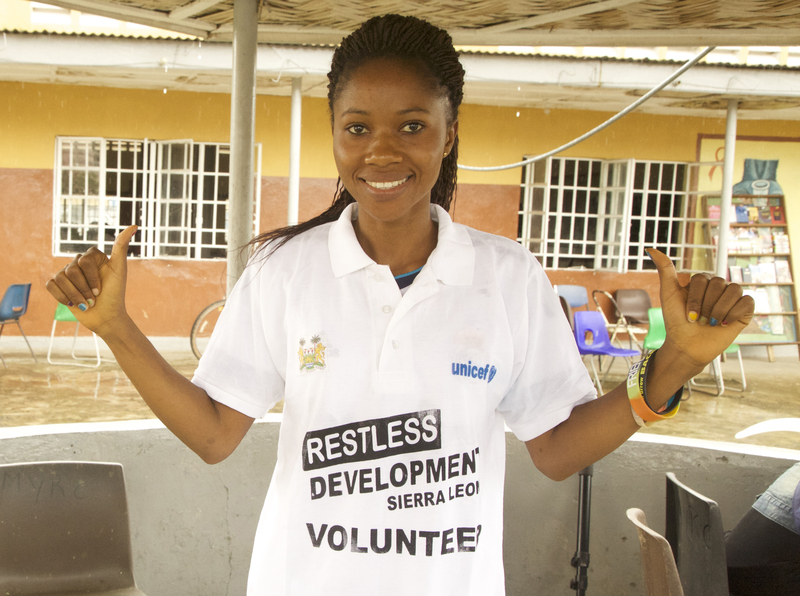 When the Ebola outbreak reached Sierra Leone, our friends at Restless Development knew they had to react. Emergency Coordinator Sara Benavent is in the capital Freetown, and took time out of her busy day to share what they are doing. We already had a network of young volunteers in Sierra Leone, and they wanted to do something to help their communities. Right now 1,500 young people are being trained up and paired with health outreach workers to visit communities and explain how to prevent, diagnose and treat Ebola, and support survivors. We’re part of SMAC (Social Mobilisation Action Consortium), along with GOAL, Focus 1000 and BBC Media Action who all work locally, and supported by the UK Department for International Development. Posters being used by community volunteers to tackle myths about Ebola in Sierra Leone. The posters we are using have been specially designed to address the stigma faced by Ebola survivors, and get the message out in a way that people like. Our volunteers also receive a manual with all the information they need and pictures to help explain the messages. The community health workers benefit from working alongside our volunteers, as they are from the local communities themselves, and more likely to be trusted. The impact Ebola is having on the country is severe. While many people are fighting for their lives in treatment centres, and families are losing loved ones, schools are closed, public transport is limited and health centres are overwhelmed. People with other illnesses and pregnant women are not receiving the same level of care. Young people here are very engaged, they want to work for a better country, for improved health services, for better education. They expect to be able to change the world, but they realise the lack of capacity their government has to provide enough services to fight Ebola. Community behaviour change is essential to stopping the outbreak, and our volunteers are working hard to influence this. With the right prevention and quarantines, the virus won’t survive. Our community-led work is saving lives. Find out more about how Restless Development is contributing to the Ebola response. We need to work together to end Ebola. Young people in Sierra Leone are stepping up, and the international community needs to do the same.